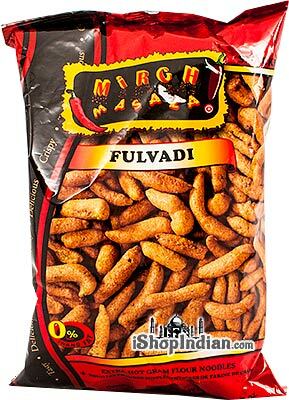 Aloo upvas chevda is a sweet and spicy potato sticks and peanut snack mixture. Ingredients: potatoes, palmolein oil, peanuts, sugar, poppy seeds, spices, watermelon seeds, citric acid, salt. Sweet and spicy fried moong beans. A unique snack great for munching. 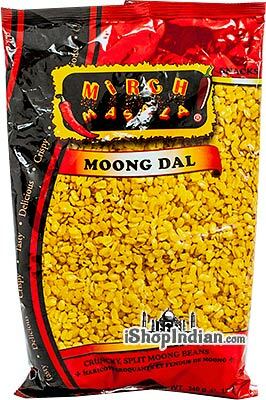 Ingredients: whole moong, palmolein oil, sugar, salt, citric acid, spices. 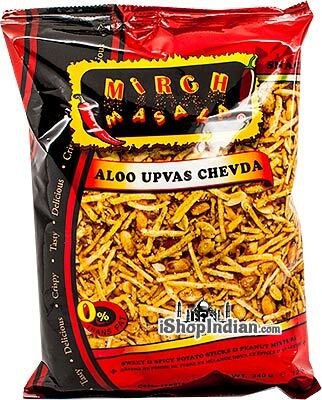 India's ultimate anytime snack. A crunchy mix of chick pea flour chips, strings and puffs. Add your favorite coriander chutney and sweet chutney for a great snack with mouth-watering flavors. Ingredients: chick pea flour, parched rice, wheat flour, rice flour, corn oil and canola oil, salt, red pepper, turmeric. 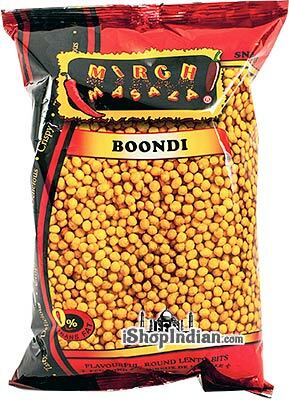 Boondi are flavourful, round lentil puffs. They are great for snacking, but are most commonly added to yogurt dishes such as raita to add a crunch. Ingredients: chick pea flour, corn oil and canola oil, salt, spices, turmeric, ajwan seeds, sodium bicarbonate. 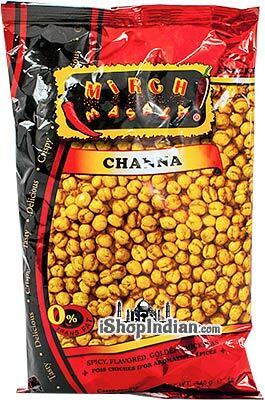 Spicy flavored whole golden chickpeas. Crunchy texture and satisfying flavor; great with cold drinks and tea time. 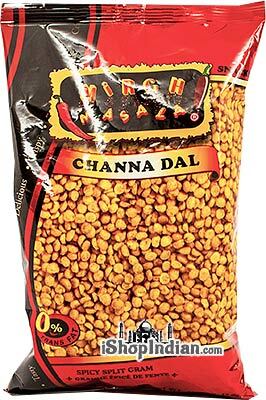 Ingredients: chick peas, corn oil or canola oil, salt, spices, citric acid, turmeric. A crunchy and flavorful snack medley of parched rice flakes, lentils and peanuts. Perfectly flavored with sweet and spicy notes. 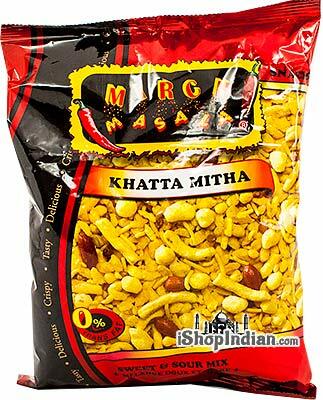 Ingredients: rice flakes, corn oil or canola oil, moong beans, split chick peas, peanuts, raisins, salt, sugar, red pepper, turmeric, sesame seeds, spices, curry leaves, citric acid, paprika. 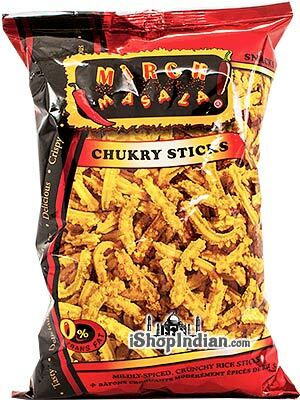 Also known as Murukku, these mildly spiced crunchy rice sticks are most popular in South India. An excellent accompaniment to coffee or tea. Ingredients: rice flour, wheat flour, corn oil and canola oil, sesame seeds, spices, salt, citric acid. 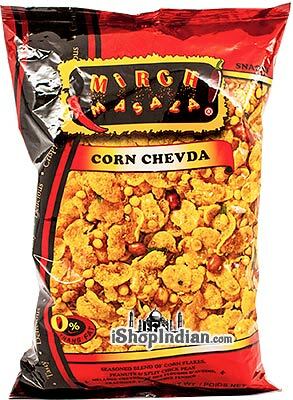 Seasoned blend of corn flakes, peanuts and split chick peas. Crunchy, spicy and satisfying in one bite. 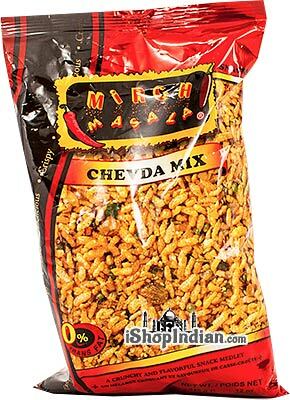 Ingredients: corn flakes, chick pea flour, corn oil or canola oil, split chick peas, peanuts, raisins, sugar, spices, salt, fennel seeds, sesame seeds, curry leaves, turmeric, citric acid. Mildly-spiced mix of lentils and chick pea noodles strings. 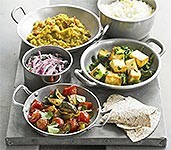 Ingredients: lentils (55%), chick pea flour (35%), corn oil and/or canola oil, red pepper, salt, turmeric, citric acid, spices. 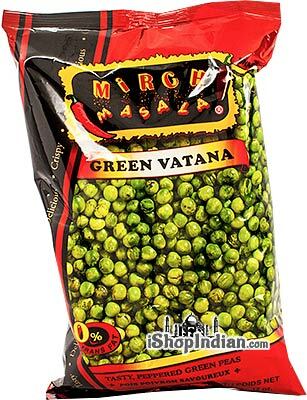 Tasty, peppered fried green peas. A crunchy and unique snack that will give your mouth a party. Ingredients: green peas, corn oil or canola oil, salt, spices , citric acid. Spiced gram flour noodles. Great for snacking or as a flavor twist to your everyday salad. 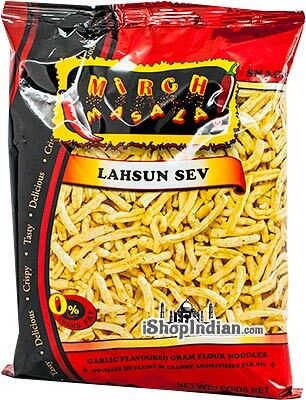 Ingredients: gram flour, palmolein oil, spices, salt. 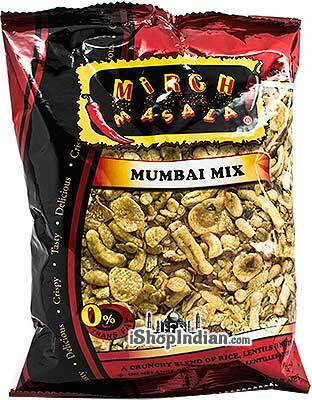 A sweet and sour snack mix made from gram flour noodles, flattened rice, peanuts and lentils. Its easy to finish this bag in one sitting! 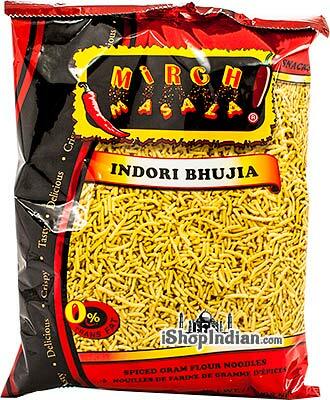 Ingredients: gram flour, pressed rice, peanuts, sago, split gram, lentils, palm oil, spices, sugar, salt, citric acid. Thick, garlic flavored gram flour noodles. Excellent with tea and coffee. 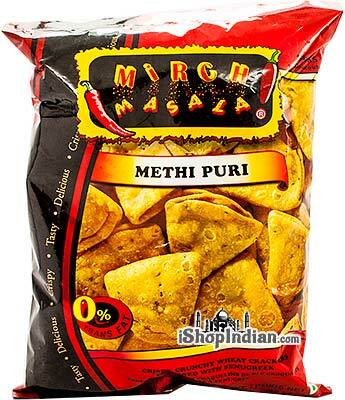 Ingredients: gram flour, palmolein oil, spices, garlic, salt. 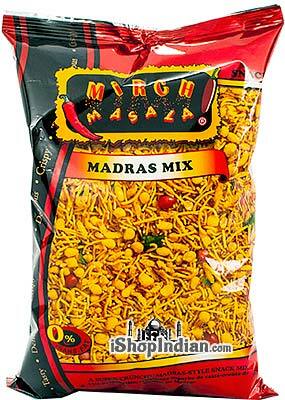 A super crunchy, Madras style snack mix with gram flour noodles, peanuts, lentils, parched rice and gram flour puffs. Mildly spiced. 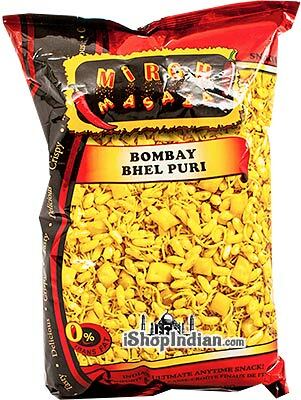 Ingredients: chick pea flour, split chick peas, rice flakes, rice flour, peanuts, corn oil and canola oil, spices, salt, curry leaves, turmeric, baking soda. 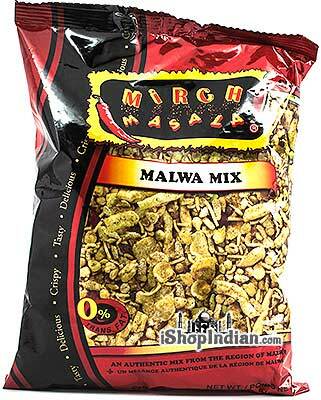 An authentic mix from the region of Malwa in India. Ingredients: Gram flour, pressed rice, corn flakes, peanut, split gram, lentils, palmolein oil, salt, coriander, spinach (for color) and spices. Crispy, crunchy folded wheat crackers flavored with fenugreek (methi). 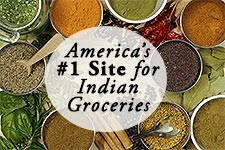 Ingredients: wheat flour, refined sunflower oil, fenugreek leaves, salt, spices, turmeric powder. 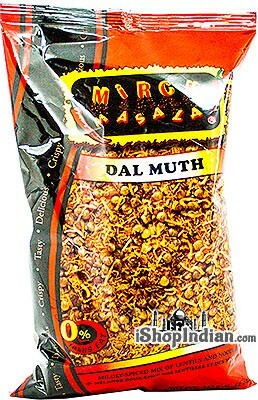 ajwain seeds. Crunchy, split fried moong beans with salt. 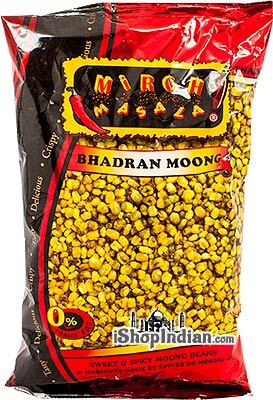 Ingredients: split moong beans, vegetable oil, salt.